A Gift from Kathleen Wynne! I very rarely read the newspaper or pay attention to the news because it’s always negative. A mentor once told me he was going to start the “GNN”, the Good News Network because everything he saw on the news was negative. I always thought that perspective was interesting as I’m a believer of positivity and optimism. There’s been so much shock to the real estate market of late that it has scared a lot of investors, homeowners and……even speculators. With the 15 % foreign buyer’s tax, rent control, sales volumes down and sales prices down in may (only on a month to month basis…no body freak out yet please :p) the public perception has been quite negative. Never fear, Kathleen Wynn to the rescue! Some of you may be wondering… what on earth am I talking about. Well in case you’ve been hiding under a rock (which I am totally guilty of sometimes) Kathleen Wynn just increased minimum wages from $11.40 to $15 by 2019. That’s a HUGE jump. Obviously, this will have a massive effect on the entire economy. Some people are preaching doom and gloom but let me shed some positivity and optimism on this for you. 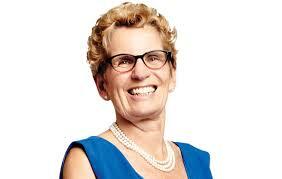 This 32% wage increase affects 1.5 million people in Ontario and I’ll guide you through my thinking. Torontian’s who make minimum wage had (maybe still having) a hard time to afford housing…. They often shared accommodations or live in basement apartments or mom’s house….. When your wages go up 32%……. you have the ability to upgrade your lifestyle SIGNIFNCANTLY…. They will look towards entry level rentals….like condos…..
That will increase the demand for rental units….. Which means increased cash flow for you fellow investors!! Cha Ching!! So it’s not all doom and gloom for the real estate market right now. Let me also shed a little bit more light on this matter. Maybe it’ll completely brighten your take on the real estate market right now. Last month the rent control practically eliminated purpose built apartments…. Which means in coming years the rental supply will be low… like REAL LOW…. Which means more rental demands than supply…. Now, here is a bonus. The 15% foreign buyer’s tax has put a bit of a shell shock to a lot of people. There are a lot less offers on listings now. We’ve even secured a listing with conditions recently. Yes!!! That’s right, conditions! Furthermore, Vancouver has rebounded back from their 15% foreign buyer’s tax 8 months ago….. so…… does this mean it is a good time to buy low before the rebound? I’m an optimist but I’ll let you decide.